Tourist class on the America. Tourist class on ships is a thing of the past. However when the America was launched in 1939 class distinction on ships was quite rigid with strict separation between First Cabin and Tourist. The only exception was an occasional adventurous small child would break out of the confines of Tourist by sliding under the locked gates. United States lines described Tourist class as a “Convenience to those who are economy-minded and desire to obtain the best possible value in ocean travel for a limited expenditure”. Value travelers frequently included students and immigrants on a limited budget and families returning to visit the homeland. The staterooms were pleasingly decorated and comfortably furnished. About half of them had private showers and toilets. The public rooms were described as “homey”, smaller and less grandiose than those in Cabin and First Class they were comfortable with a warm friendly atmosphere. The same care and talent went into decorating all public rooms in the ship. They were so well done that it was difficult first glance detect a difference in class. 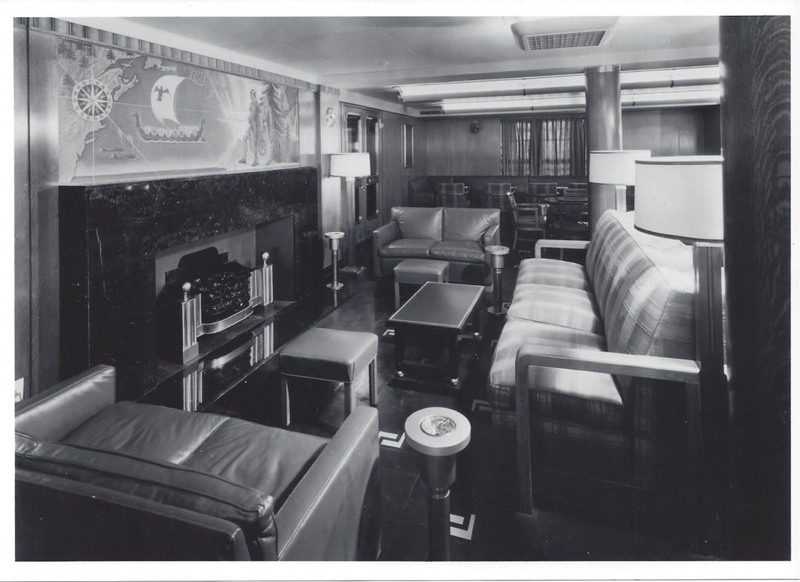 Assistant Purser Morris Luft described the tourist Class smoking room as ” One of the nicest rooms on the ship”. As for food it was good and there was plenty of it. For many it was their first taste of American food. A typical menu featured would be fried chicken Southern style, Cream Sauce, boiled potatoes or round tips sirloin of beef. Desert was chocolate pudding. The dining room was air-conditioned and attractively furnished with the same good service found in the other classes. The drawbacks of traveling Tourist was the lack of space and location. The 51 cabins were located in the less desirable bow were the pitching motion was more pronounced. Passengers shared the limited windswept spaces with the cargo hatches. The “enclosed” promenade on Main Deck was an open space between the decks. Waves breaking over the bow would render these spaces Off limits confining passengers to cabins or the two public rooms. In 1961 US Lines was struggling to fill the ship in all classes. To increase passenger bookings in Tourist they made it larger and more attractive by combining Cabin and Tourist spaces into a new improved Tourist class. 1971 I was 7 years old, travelling with my parents and sister from New Zealand to Holland to visit family. What an amazing trip we had, such an adventure. There were so many activities on board, Greek dancing, movies, cocktail parties for the adults, swimming pools, school for us kids, even church! I remember getting off in Mexico and mum buying us dolls. The food was different to what we were used to, but good. A cozy corner of the Cabin Class smoking room. This was one of the more attractive rooms on the ship and it's easy to see why. Low ceilings, comfortable chairs of Lackawanna leather or hand woven fabric and a fireplace provide a congenial clubby ambiance.No doubt that many good drinks and stories were enjoyed around the Glenn More Shaw mural. It featured that first hearty group of transatlantic passengers; the Vikings..Below is the aft end of the smoking room with Glenn Moore Shaw mural of Columbus arriving in the New World.Photo Everett E Viez/SSHA Library, University of Baltimore.